The idea is that people with resilient abilities are able to access these positive emotional resources and thereby exhibit and experience greater resiliency, coping ability, and resistance to stressors. We would suggest that Motivational Inteviewing can play a huge role in building resilience as a coping mechanism. We know that communication, support, trust, encouragement, acknowledgement, a strong self concept, and a positive self image, among a host of other factors are key aspects of building resilient skills and they are all aspects of engagement inherent in MI work. By utilizing MI in their work, logic and evidence point to the importance of health professionals in working with their clients to develop, hone, and expand their resiliency. 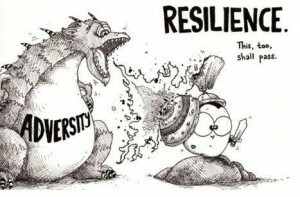 Whether resilience is caught (a trait) or taught (learned) or both, MI is a potent way of being with clients in fostering their resilience.